After noticing my 10 Easy Ways To Improve Your Blog post has in fact been one of my most popular posts (thank you to everyone that’s read and commented!) I thought I’d follow on with some more helpful posts along the same lines. 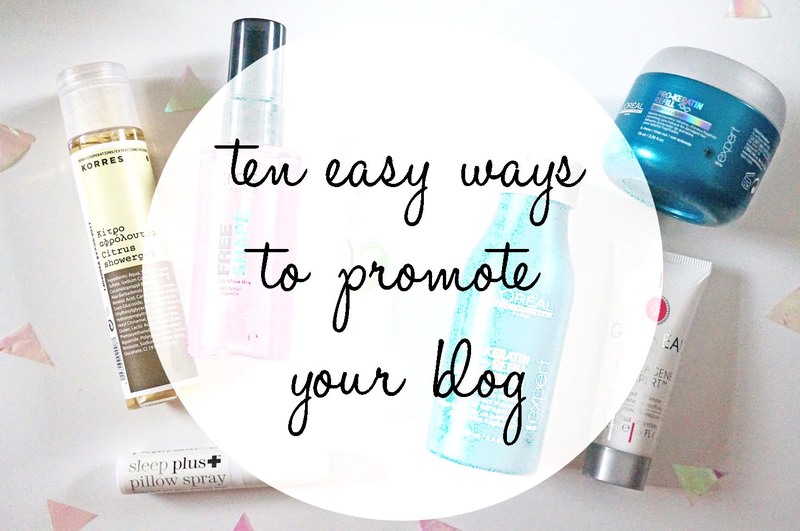 Today I’ve put together a few simple tips for promoting and sharing your blog. Enjoy! 1. Social media. A blogger without social media profiles is like a butterfly without wings – you’re really missing some vital parts crucial to development and growth. Using social media is SO important for promoting your blog. Firstly you need to get yourself signed up to all the social media sites you can – Twitter, Intagram, Facebook, Pinterest and Facebook are the main players but there are plenty more worth signing up to if you have the time. Then use them. Follow like minded people. Interact. Share your blog posts, and in time you’ll see your followings grow, whilst also creating a fantastic audience for your blog. 2. Facebook groups. Out of all the social media sites, Facebook isn’t really the best place for promoting your blog now because they’ve changed the way they work. If you already have a Facebook page for your blog, you may have noticed you’re receiving less views per post than previously, basically this is because Facebook now want you to you pay them for advertising your page. Another (possibly better) way to utilise the power of Facebook is to join relevant groups. The easiest way to find groups is to try loads of keyword searches in the search bar – ‘beauty blogger’ ‘bloggers’ ‘beauty lovers’ are a few examples I might use as a predominantly beauty blogger. Then just join the groups! Some are purely for chatting, you can share your blog post links in others, and some have more specific blogger help, sharing threads and much more. 5. Linkys. What the heck is a linky? A linky, link up, or blog hop is when a ‘host’ blog invites other blogs to link up to a specific post. Usually there will be a theme – say a giveaway for example – so you link your own giveaway post to the host’s linky giveaway post, with the idea that everyone involved visits each others posts, comments on, promotes and therefore drives traffic to their own as well as each other’s blogs. The more effort everyone puts in to a linky, the more everyone gets out of it. You can search for linkys on Twitter if you’re interested in joining up. 6. Guest post. Guest posting for other bloggers or even companies and brands can be a great way to introduce yourself and your blog to a new audience, and also expose your writing to a mass of new potential readers. Ask other bloggers if you can guest post for them, give them some ideas of what you’d like to write, or maybe you could swap guest posts? Guest posting on companies’ blogs is a fantastic way to promote yourself too, as your blog will be exposed to their customer base. Don’t forget to include some info about your blog and your blog link in your post too! 7. Collaborate with other bloggers. Guest posting is one thing, but what about actually collaborating with other bloggers? I’ve done a few collaborations in my time, the latest one – Makeup To Make Your Blue Eyes POP! was a collaboration with Emma from Not Your average. I have blue eyes so I wrote a ‘blue eyes’ themed post and she has brown eyes so she wrote about brown eyes. We then both linked to each others post, published at the same time, and promoted each others posts on our social media sites. Collaborating with other bloggers is a win-win situation which exposes your blog to new readers. If you have any collaboration ideas, ask around on Twitter using the relevant hashtags (#bbloggers for example) to see if anyone would like to work with you. 8. Comment on other blogs. If you read blogs (which I’m guessing you do) please try to take a moment to leave a comment (preferably 8 words or over if you can, as less than that can be seen as spam by Google so I’ve heard) Every blogger LOVES receiving comments on their post – it shows that people have taken the time to read, think about what they’ve read, and offer their thoughts. This makes us feel warm and fuzzy and we really do appreciate it. So, bloggers, if you want to receive comments, also make sure you take the time to leave some for others, and don’t forget to include your blog link so they can click through to check your writing out too. 9. Include relevant links in your posts to companies, brands, products and other bloggers, and let them know you’ve included them in your post via social media or email. Many people will at least take a look at what you’ve written, and some will also share / retweet your post too. When I mention other bloggers, companies or brands in a post, I always tweet them directly letting them know and include the post link with the hope that they will take a look! Sorry this was another long post, well done for making it to the end! Another amazing post! I absolutely love reading your blog Michelle! This post was so helpful im coming up to my 1st blog birthday soon and I’m trying to get more of an engaging audience for my blog so hopefully your tips will help! & I’ll let you know if they do! Such a helpful post! Gave a some new ideas on being creative with my blog and so just got the courage to email round a couple of other bloggers and see if they’d like to collaborate.